If those little yellow creatures from “Despicable Me” and its sequel drove you bananas, you’ll find no respite at “Minions,” the third chapter in the series. Gru and his adopted daughters are nowhere to be found, nor are Pharrell Williams’ catchy songs. Instead, Gru’s loyal sidekicks step into the spotlight, underscored by a '60s era, Beatles-heavy soundtrack that must have cost a fortune in rights. Guided (and voiced) by co-director Pierre Coffin, the minion species earns an origin story that begins in the primordial soup and ends 42 years B.G. (Before Gru). Since “Minions” removes the emotional anchors of this series, one might assume that it is a heartless cash grab perpetrated by the greedy folks at Universal. And your assumption would be wrong, because this movie isn’t heartless. “Minions” is relentless, however, and in more ways than one. It’s relentless in its depiction of the slapstick-infused shenanigans that will keep the little ones entranced in their seats. Then, sensing the duress that parents were under when their aforementioned crumbsnatchers demanded to see it, the film relentlessly throws every single oldies station pop and rock song it can find at the speakers. “Minions” opens with The Turtles’ “Happy Together,” ends post-credits with The Beatles’ “Revolution” and finds time for a number from “Hair” that threatens to end the way Act 1 of that musical did. If that weren’t enough, the voice talent includes "Mad Men"’s Jon Hamm, "Birdman’"s Michael Keaton and Sandra Bullock as Gru’s villainous precursor, the delectably named Scarlett Overkill. Before we get to evil Sandy Bullock, our narrator (a droll Geoffrey Rush) takes us through the evolution of the minion. They climbed out of the soup to serve T-Rexes, pharaohs and even Napoleon, who banished them to Antarctica after an unfortunate cannon accident. Fed up with their frigid existence, minion leader Kevin sets out to find a new master for his brethren. He asks for volunteers and gets one-eyed Stuart and goofy runt Bob, who is small even by minion standards. On their journey, this cute trio occasionally breaks into song, singing in that nonsense mix of Spanish, French, and God knows what else Coffin utters for them. (I understood some of their dialogue, which scared the hell out of me.) Their lack of an identifiable dialect may be one reason “Minions” will do gangbusters overseas. This is a film where dubbing of its main characters will prove unnecessary. This is also why, out of all the “Despicable Me” films, “Minions” is the most suited for the youngest of moviegoers. The minion mission is to reach the 1968 Villain-Con conference, where they can hook up with eligible baddies. Their first stop is a gorgeously rendered New York City. From there, they hitch a ride to Orlando with a family of bank robbers led by Keaton and Alison Janney. They makes the most of their short screen time, bringing a lively delivery to their lines before the film executes a hilarious clothing sight gag. Keaton and Janney are a lot more fun than Scarlett Overkill, whose goal is also robbery but of a more royal variety. When it comes to defining characteristics, Overkill could have used more of her surname. Despite a great entrance that highlights Bullock’s best line reading in the film, she’s an incredibly bland villain. Her reputation precedes her—she’s touted as the ne plus ultra of villainy—but all she seems to do is yell. Since the minions’ main purpose in life is to serve the world’s most evil masters, Scarlett is their Mount Everest. 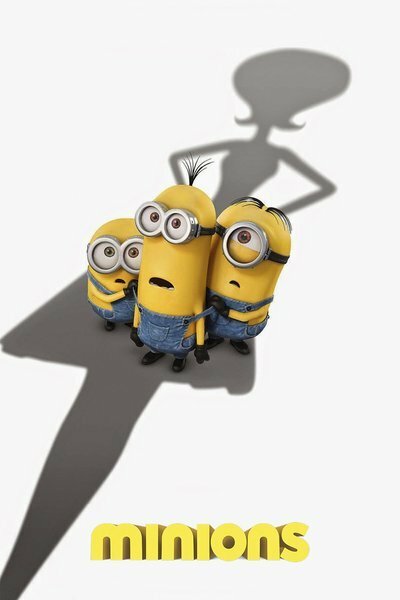 She’s looking for new minions to help her steal the crown jewels and become Queen of England, so Kevin and his crew eagerly sign up for the audition. Unfortunately for Kevin and company, Queen Elizabeth II won’t be an easy victim. She’s a lot more spry in 1968 than she’ll be in 2015. She clobbers the minions in their first meeting. The Queen also comes off as more Swingin’ Sixties babe than the Oscar-winning Helen Mirren portrayal, though I suppose she could be channeling the 1968 version of Helen Mirren. In the role, Jennifer Saunders is absolutely fabulous; along with its colorful attention to its famous locales, she’s the movie’s secret weapon. I can only imagine how the second half jabs at all things British will play in the U.K., but like everything else in “Minions,” they come as a fast and furious series of non-stop gags. The film ends with the appearance of a famous character from the series, which can be read as either the biggest fan pander or the set-up for yet another prequel that will bridge the gap between “Minions” and “Despicable Me.” I’d like to see that movie. In fact, that story should have been the plot of this movie. No matter, for we must play the hand we are dealt. The unquenchable desire to please emanating from the screen is, quite frankly, exhausting. “Minions” is a big, slobbery dog who licks your face, brings your slippers and humps your leg before turning into an adorable kitten with big eyes and a soulful mew. And, so help me, I couldn’t stay mad at it for long. Every time it got aggravating, it would immediately do something that made me smile and forgive it. Bear in mind that, as my "Despicable Me 2" review mentioned, I’m a big minions fan. Fandom is a pre-requisite for this movie, and if you’re not a fan, your kids probably are. Grin and bear it for them, because like that Pharrell song from the last movie, “Minions” is probably going to be inescapable.